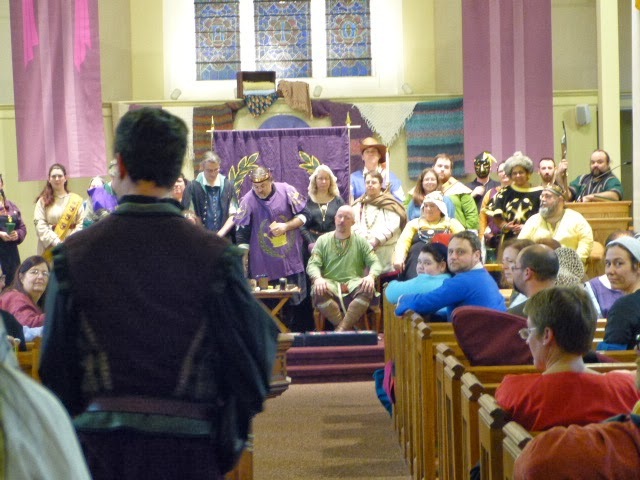 As I indicated in my previous post, I had two performance opportunities at yesterday’s EK Bardic Championships (which were held alongside Novice Schola, a free event for to introduce newcomers to the SCA, its culture, and the sorts of classes that are offered at events). 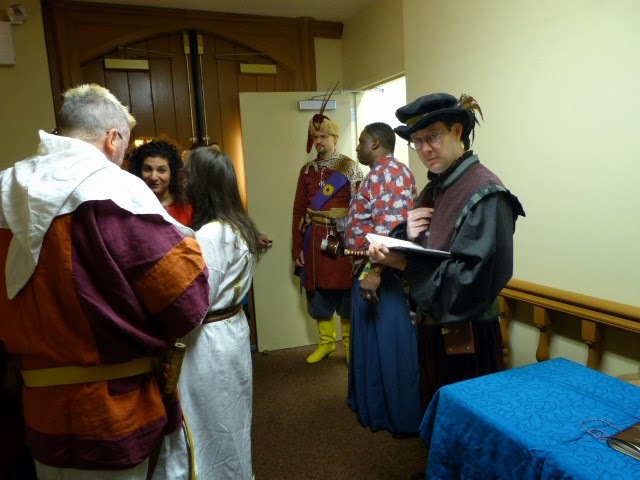 The second one involved an elevation (or induction) into the Order of the Laurel for Ose Silverhair, a part of our extended SCA “family”. So first a bit of background. Brid ni Shearlais, our close friend, is a double Peer. As a Pelican, she is training my wife in the art of SCA service; as a Laurel, she has been training Ose in Fiber Arts for several years. She is also my patroness, which is not a formalized relationship but one she and I both take seriously. All three of those relationships came into play in the lead-up to yesterday. The Order and the Crown had decided it was time to elevate Ose, ending her apprenticeship and making her a full Peer. Usually, a Peer is given a “writ” of elevation at one event, and then they hold vigil at the next available event and conclude with the elevation ceremony at court. Occasionally, they decide to spring the surprise and do everything–the invitation, the vigil, and the elevation–at the same event. Brid knew that Ose, who still assumed she was years away from this, would find it less stressful to just have it sprung on her and do the whole thing at once. Brid asked me, a couple of months back, if I would be willing to compose a piece to perform at the elevation. It was no small honor, and quite a stretch for me. Ose’s persona is early Danish, a far cry from my English Tudor minstrel. There are several bards just in their neighborhood who have Scandinavian personas and can do Norse/Viking poetry. But Brid wanted to offer me the chance to take this on, knowing I’d never written a praise piece for a specific person before. It’s an important part of a Scadian bard’s profile, especially if one can compose something that is in a style appropriate for the recipient. The other challenge is I only knew Ose herself casually up to this point. She’s pretty quiet, and I’m, well, not, so we hadn’t talked much. And quickly it came out that the elevation, whose date wasn’t definite at first, was going to be the day of the Bardic Championships. So by mid-January I had two very different challenges to prepare for the same event. Brid made it clear I didn’t need to say yes. But I didn’t want to disappoint, and I couldn’t resist the challenge. It would be a wonderful growth opportunity, and a chance to get to know Ose better, who was clearly a lovely and deserving person. The turning point was when my researches stumbled upon Drømde mik en drøm i nat, the oldest known Danish folk song, which I immediately knew would be the right piece to use. It was explicitly Danish, I quickly discovered it was well known and very popular in Scadian circles, and the fragment of lyric that exists translates in ways that lent themselves nicely to a contrafact lyric about a fiber arts Laurel. That, an interview with Brid about Ose, and some time scouring Ose’s own blog about her work, gave me what I needed. Here is the resulting song. She dreamed herself a dream one night of silk and thread to spin. from Ribe she set forth. She sought for hidden knowledge-gems which pathward led to joy. She sought to build a dream for all of heart-gifts freely shared. The knowledge that she gives away enriches everyone. This alms-giver, this ring-giver, she waters souls to grow. Ose, who had taught a class at the Novice Schola, was appropriately flabbergasted and overjoyed when she was told how she’d really be spending the rest of her day. At Jess’s suggestion, I visited Ose during her vigil, along with Jess and Brid, to deliver the piece to her, so she could hear and enjoy it privately before the ceremony (where it was likely she’d be overwhelmed and not able to take it in). Her first words when I explained what I was about to sing for her were, “No one’s ever written a song for me. What a gift!” That was itself as powerful a moment for me as anything else that happened that day. And thus, I had the privilege of leading the procession for her elevation ceremony with this song, just before the end of the day. As I mentioned last night, the challenge and the pride of being able to offer this up for such a special occasion made it that much easier to not be over-attached to the outcome of the Championship. The SCA is really freaking cool. And I realize more and more this year that I’ve just scratched the surface. This entry was posted in bardic, Laurels, SCA by Drake Oranwood. Bookmark the permalink.